Great product for the price, & my nieces love theirs. I use these as extra gifts to Christmas packages or as a stocking stuffer. Also can be used as a pendent. These were ordered for Young Ladies who are Seniors in High School, and they were delighted. Some were going to put them on Christmas trees, some were going to hang them in their cars. They were just what I expected. These are light enough to easily hang on any Christmas tree. Brilliant shine front and back with birthstone and personalization make a perfect gift. I bought oneof these last year for my Grandaugher's first Christmas. This year I bought another for my Grandson's first Christmas. A nice gift for someone who is challenging to surprise. The ornaments are very pretty. The names are wrote beautifully. The birth stones are a bonus. I gave each of my grandaughters an ornament for their tree and 1 hangs on my tree! They love seeing their special ornaments on the tree! 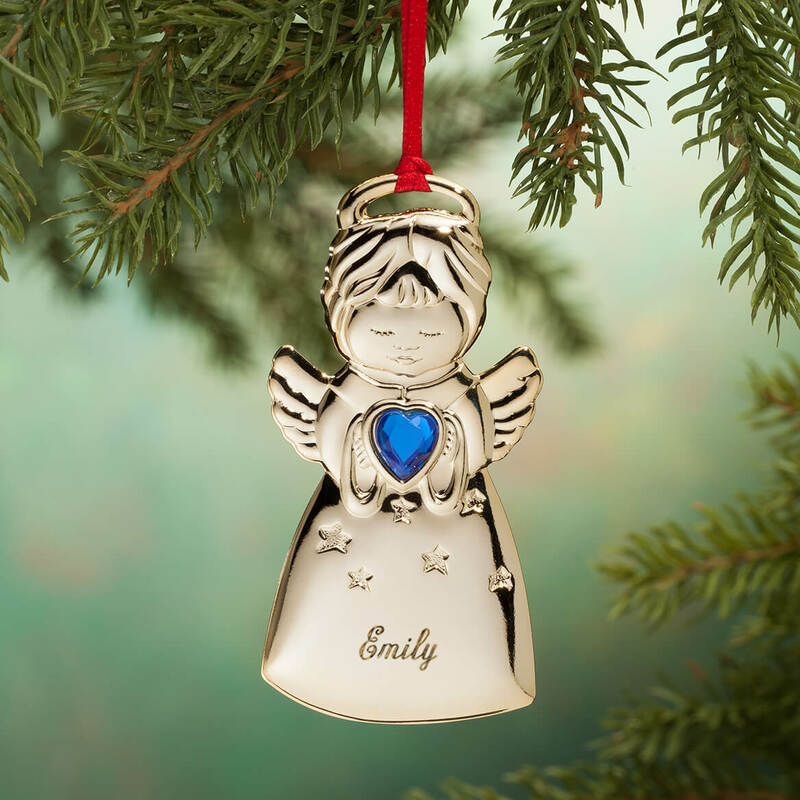 I just love the fact that each child can have a lovely ornament, with their own birthstone, AND their names on it. A lovely keepsake. In addition to an ornament, I plan to use the angel as a parcel tag. The size will be perfect! I have given these simple ornaments as memorial gifts over the last five years most notably in remembrance of my mom and dad and grandparents. They make wonderful tributes which can be hung on a tree. The engraving is always so professional and the birthstones give an extra bit of character. 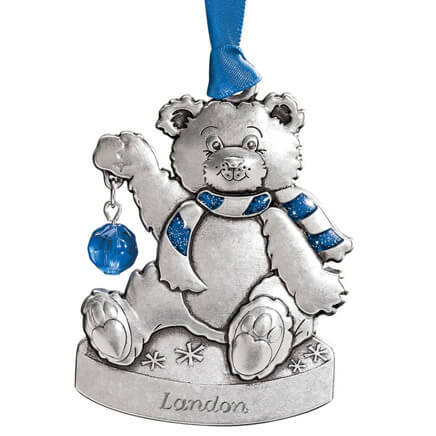 Buy these ornaments each time a new niece or nephew is added to the family. The girls get the angel and the boys will get either the snowman or teddy bear. They're adorable and the addition of the birthstone and name makes them the perfect gift! It is money well spent. Wish they could color the the engraving in Black or white etc. so it stands out better on the ornament. Christmas gift for my 4-year old granddaughter and she loved it! Wants to keep it out in her room all year long, not just for the Holidays. Gave my granddaughters these for Christmas and bought myself one for myself with one of my granddaughters name on it. Great gifts for family members! Personalized ornaments were appreciated by the recipients. I ordered this ornament not for my Christmas tree, but to hang from my rearview mirror after my husband nearly died in a car crash. Instead of a person's name, I had it engraved with "God Is Good." It would make a perfect ornament but is also great as a car angel. Highly recommended. The girls like to hang their own ornament on the tree and their parents don't have to worry about them getting broken! We now have three angels on our tree what a great memory. These brass Christmas ornaments are cute and won't break when my toddler grandchildren put them on their tree! They even have their own name and birthstone on each ornament. 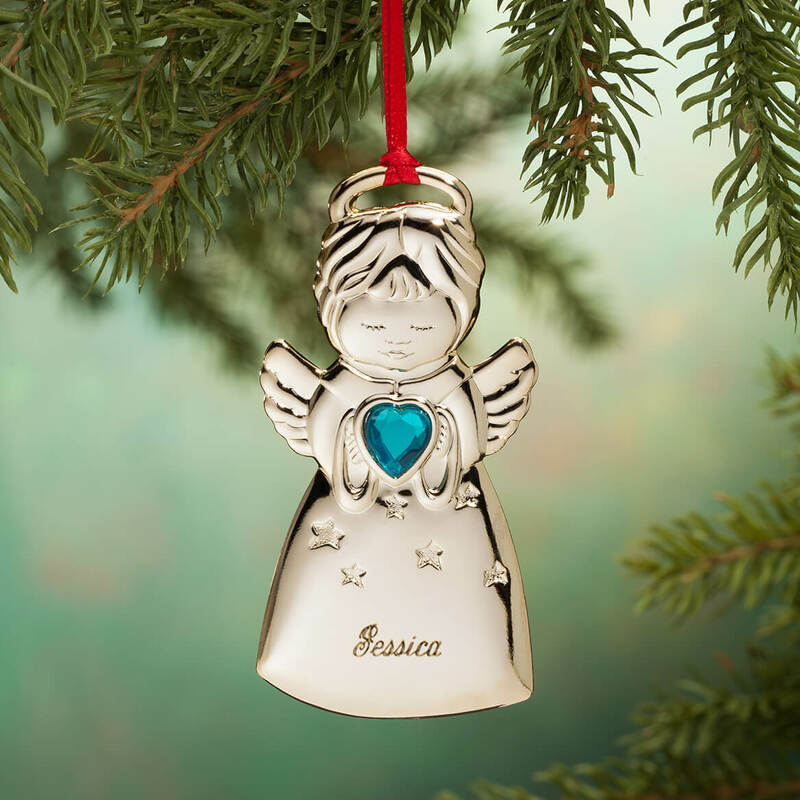 I purchased quite a few of these angel ornaments and they were a huge hit for all the people I gave them to. I love these ornaments. I've always thought of my Children as my piece of heaven and I saw these and it was perfect. The birthstone gem was a nice touch. I only with they could have had the year put on them. 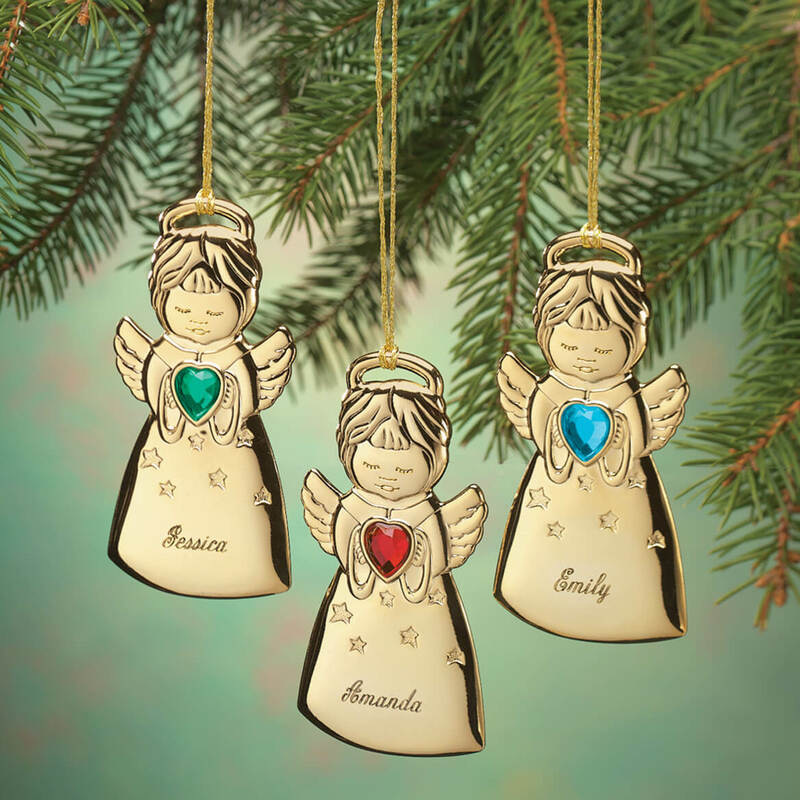 These beautiful angels make great gifts for Christmas, birthdays, or any special occasion. The heart-shaped acrylic birthstones and personalized names make them even more special. Anyone would love to receive these. The only thing that I would suggest is to allow the customers to order these with both a name and date that can be engraved on two lines instead of only on one line. 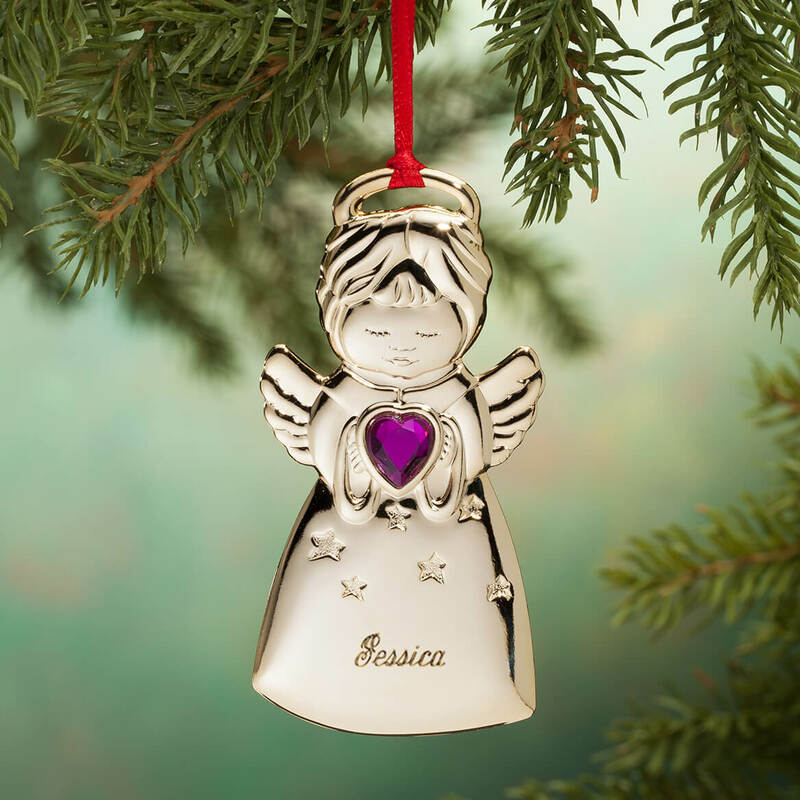 We buy a Christmas ornament for our kids and grand-kids every year, the birthstone angels are wonderful. These are perfect for my twin great-granddaughters' first Christmas. Love 'em. I bought three of these for my three granddaughters ages 4, 6, and 8 and will send them to them as a "pre-Christmas" gift so they can hang them on the tree. They are adorable angels, nicely-sized with generous, brightly-colored birthstones that are sure to thrill the girls. They are also the right weight so as not to be too heavy for a tree branch. One little comment...I wish the personalized engraving (which is a pretty script) were either a little larger or more pronounced. You do have to look closely for the name. Otherwise, I do like them and may make a tradition of sending personalized ornaments in the future. I bought these to identify Christmas gifts for my nieces. I would buy some more. 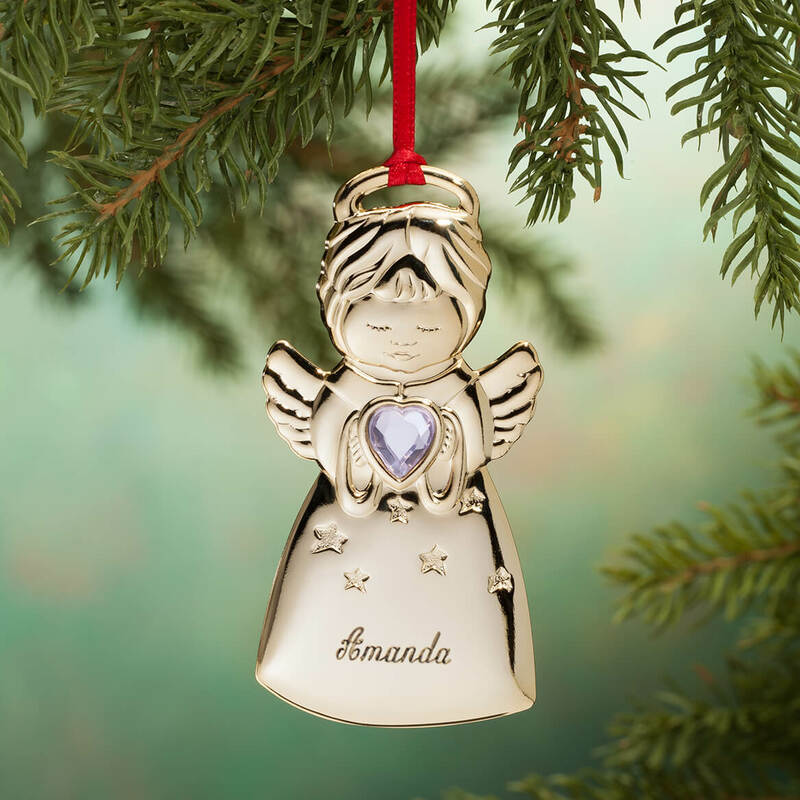 This is a Christmas ornament for my 1st great-grand-daughter.love it. I gave three of these as gifts to my step-daughter-one for each of my grandchildren (her 3 daughters). She was thrilled w/them because of the personalization, both the name & birthstone. Of course they're durable & always 'in style'. They're angels & made of brass. Thanx for making my daughter's (& therefore mine) holiday more memorable!! Cute ornaments, they will last!! Mistake was made on one ornament, called and a new one was sent right away, no charge. I like that. I bought these for my niece's little girls. They LOVED them....their mother really LOVED them!! Their names engraved on them was special. For 25 years we have given each grandchild an ornament for Christmas. 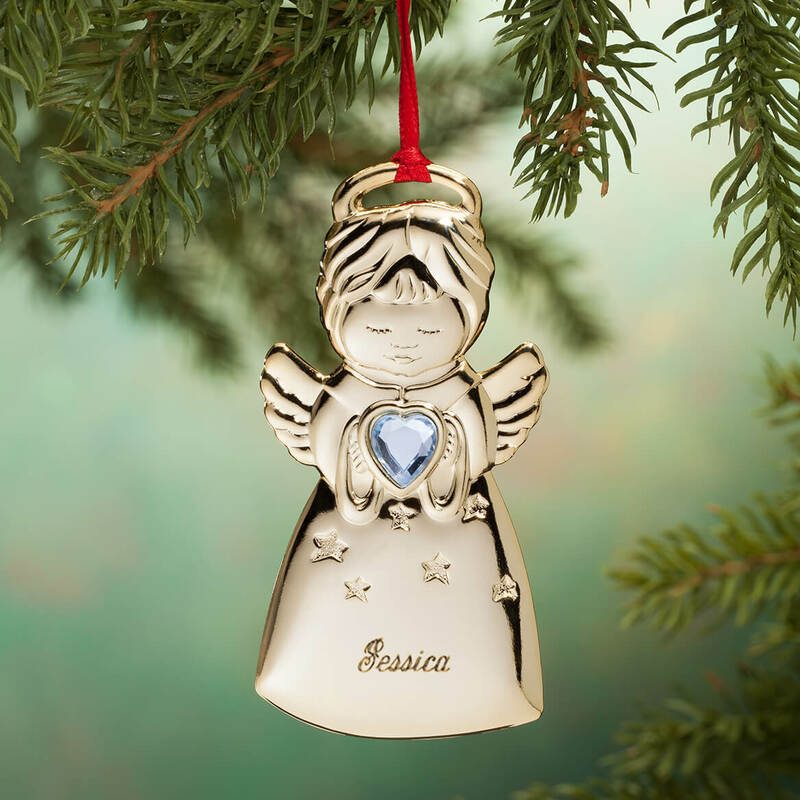 The angels will be the last ornament for two of the grandchildren as they are old enough to start their own trees. I had been looking every where for these and my mom told me about your catalog so I searched you online and I ame so glad I did will be ordering more of this type of things later this year and for years to come. I gave these to my granddaughters ages 7 and 9 as stocking stuffers for Christmas. They both loved having their names and birthstones on them. All that needed to be done was add ribbons for hanging on the Christmas tree. bought them as gifts to add a personal touch for family and friends, not hurting my pocketbook. While not made of unbendable metal they are made of quality material. Engraving is very legible, birthstone can be glued back in if it would happen to come out. Customer service was very helpful and very prompt during the holiday season. Was offer an exchange/refund for the one ornament that had the birthstone come off of, as mentioned I found it to be an easy fix.
. Indeed, these angels are lovely, and unbreakable! I don't have to worry about surprise breakage. They were perfect since each one had my name of my grandchildren! I like the birthstone ornaments. There good keep sakes. For a memory Christmas tree in memory of loved ones. I have not seen the items as yet,but they do look nice. I chose this because it reminded me of my granddaughter, who is now 11...soon to be 12. I often try to find small items to use on our grandchildren's gifts for decorations as opposed to bows. I know she will love and this and will immediately place it on the Christmas tree. I bought these as Christmas gifts for my grandchildren. They're my little Angels. 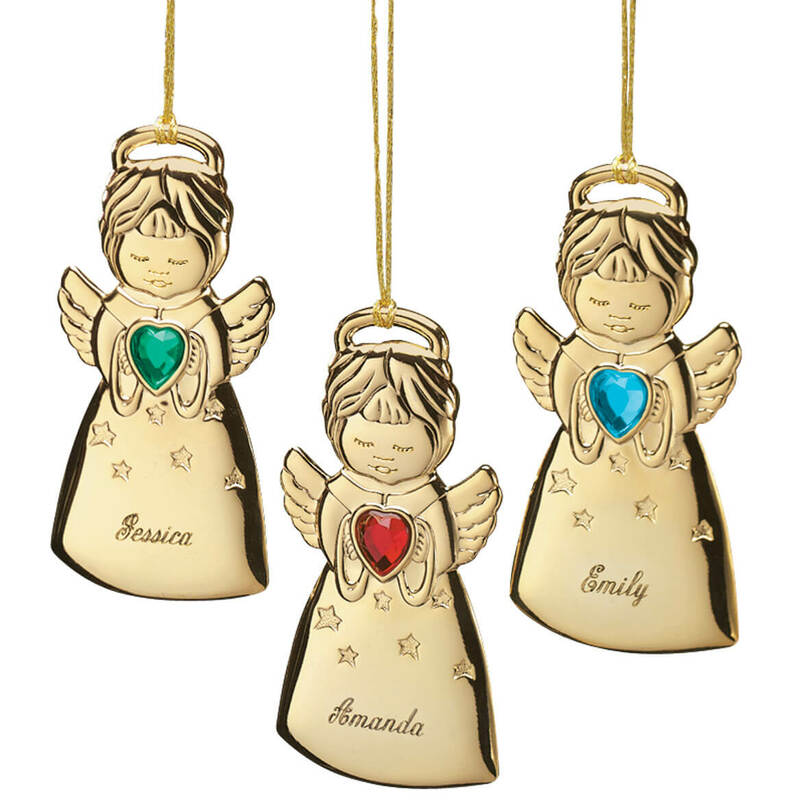 These Angel ornaments are perfect as they have both their names and birthstones on them which makes them more special. I have one for every member of our family, sixteen plus this one for a new baby coming! I order this ornament for every grandchild, niece, and nephew in our family. 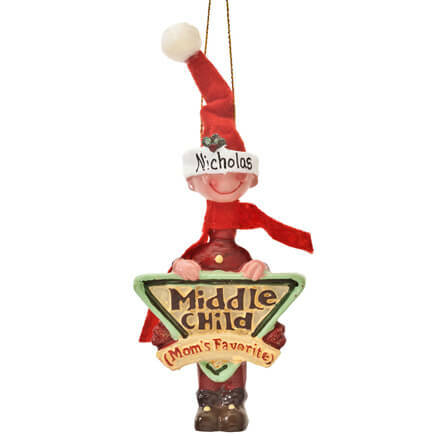 Every adult knows that their child will hang one on their tree! Nice Christmas package add on. For my granddaughter, I try to get something new each year for her on our tree. I like the gold and sliver birthstone ornaments the best. They are keep scapes. decided to add my sister (who I live with) and myself this year!! My 3 grandchildren became angels on May 3, 2018. I have gotten one of these for each member of the family and this is for my new granddaughter plus one for me. 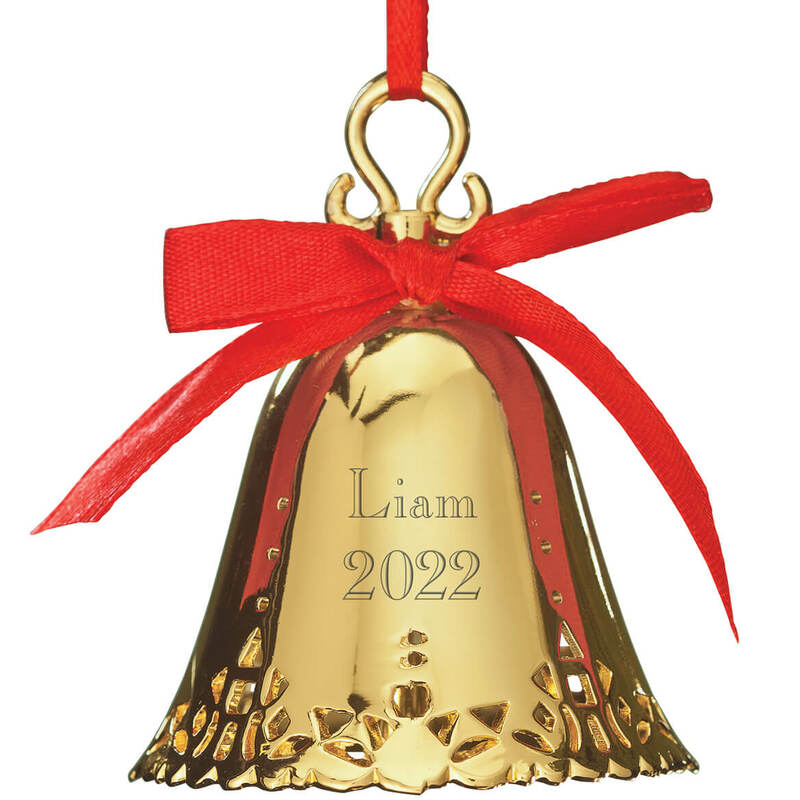 It would help if you showed the personalized name on the ornament on the checkout order summary ! I have one of these ornaments for every female in the family to identify their stocking, new granddaughter need one for this year. I wanted this because I call my youngest daughter Angelgirl. I know one day I won't be here on earth I bought it because she was born in december and so every year she has a special reminder of my love and nickname for her, and hopefully then in some way she will feel I am always there with her. 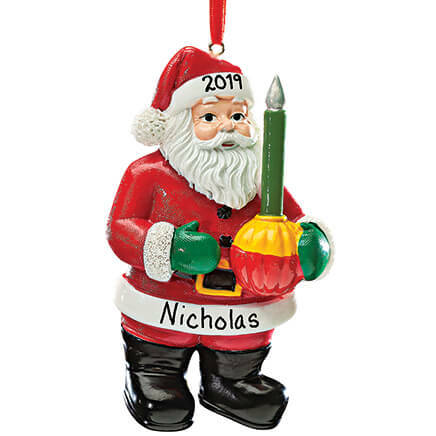 I love the tradition of personalized ornaments and these caught my eye.They look well made and should last a long time , plan on ordering again in the future. When I've tried to purchase "generic" personalized items, I can't find my daughter's name because of its spelling and my oldest granddaughter's name is Freedom. My name is very common so I usually can't find my name either. I was excited but let down at the fact that there weren't any month of May ornaments. Now I have to try to find one for my youngest granddaughter (Monica) who was born in May. It is so perfect for a girl especially an older one who would appreciate her birthstone on it. I'm not sure what the question is, but the birthstone colors are very close to what they should be. The ornament was well made and should last many, many years but there should have been a ribbon or loop for hanging. Mine did not have one. very good. The July one I got looks a little darker than a real ruby. But for the price its very good. I got ones for September which were dark blue. The one for June was clear as was the one for April. How can I choose which color the heart is? BEST ANSWER: To choose the color of the heart, you need to choose the birthstone of a month, then enter the name of that month into the order form. For instance, I wanted a purple stone because it is my favorite color, so I entered the month of February (because the birthstone for February is amethyst). Many regular calendars show the birthstone for the month, or you could google monthly birthstones. I love my angel - it is very pretty. The hearts are the color of the birth month. If you wish a particular color, look up birthstone colors and enter that month. click on personalize (select), if the month don't come up they are sold out. Do you have boy Angels? BEST ANSWER: Thank you for your question. This is the way this item comes. Some customers purchase them with boy names. We hope this information will be of help to you. HOW TO I SPECIFY NAME? 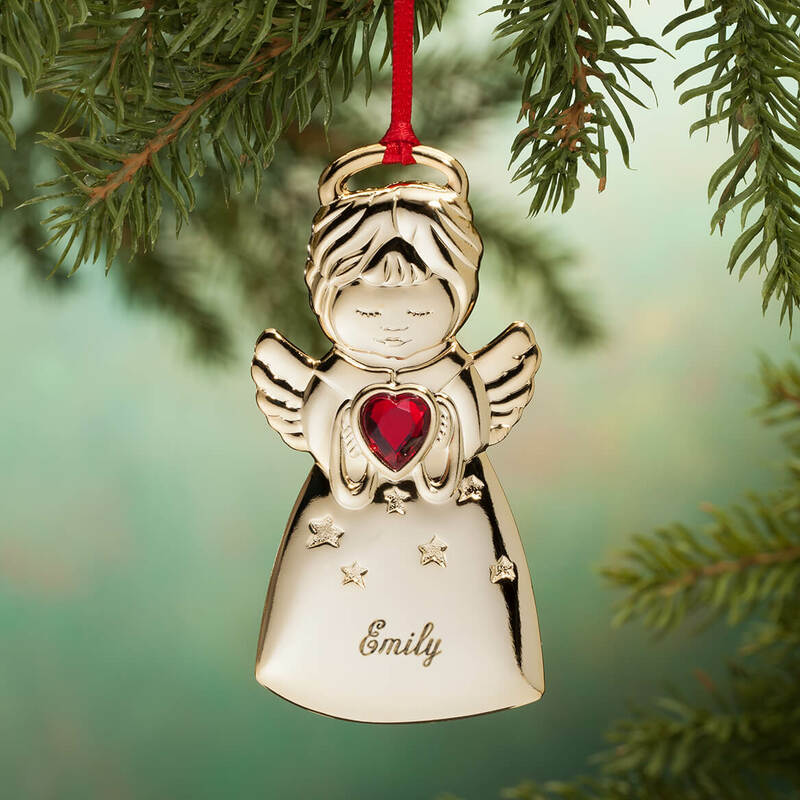 I bought this ornament for my granddaughter.In fact I have 11 gr.daughters and have gotten one for all of them.I simply had their first name put on the ornament along with the stone of their birth month.I have always been pleased with Miles Kimball! Miles Kimball has a place for personalization where you can write in a desired name. There is a place on the eform where they ask for correct spelling of name. What is the size of this ornament? BEST ANSWER: Illustration says they are 3 1/2 " high and 1 3/4" L. I am quite happy with them. I bought 4 for my great granddaughters. Thank you for your question.These are 1 3/4"L x 3 1/2"H. We hope this information will be of help to you. 1 Can I still get one in time for Christmas? 2 I have 5 to order. How do I do them all with names? Is it individually? I don't see how to do that. BEST ANSWER: Thank you for your question. Unfortunately we are past Christmas. 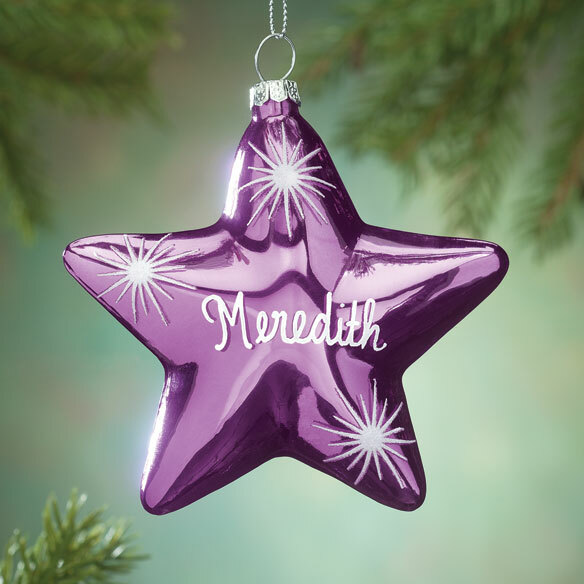 If you would still like them please personalize one ornament at a time and add them to cart. They cannot all be done at once. We hope this information will be of help to you. I Want A Personalized Angel For September But I Do not see that month? BEST ANSWER: Thank you for your question. This item is a seasonal item, September is sold out. We suggest checking back in August/September. We hope this information will be of help to you.